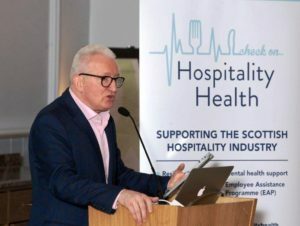 The event, which took place at the Grand Central Hotel in Glasgow, saw a number of industry stalwarts congregate to celebrate the launch of Hospitality Health (HH), a new initiative which aims to place the welfare of staff in the sector as a top priority. As the first such charity of its kind in Scotland, HH aims to address mental health awareness through a dedicated online portal and 24-hour manned helpline. Conceived in partnership with Hospitality Action, the charity aims to provide independent confidential advice, support and assistance to people experiencing mental health issues within the sector. 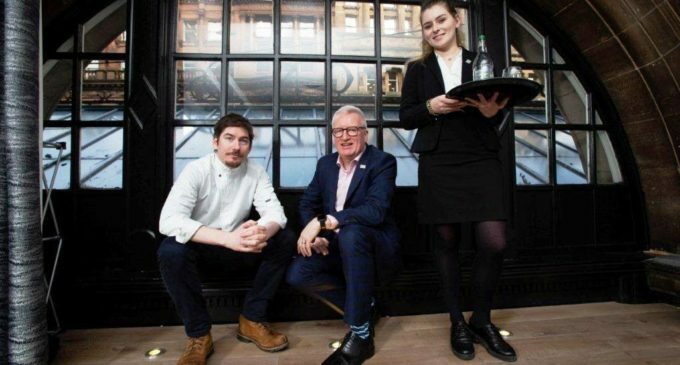 Businesses that commit to the Wellness Charter will adopt an Employee Assistance Programme designed specifically to assist hospitality workers for one-on-one confidential support, counselling and crisis intervention. Mr McIntyre (pictured left and above centre), said: ‘Hospitality Health was created in response to a rise in anxiety, stress and depression in the industry, and while its aim is to improve the emotional lives of individuals, they will also provide much-needed support with gambling, drug and alcohol abuse. ‘We believe that recognising and understanding employees’ emotions is essential for employers, and giving them the tools and skills to understand stress will help tackle the taboo of mental health. ‘We want to encourage staff to eat well, exercise regularly and drink responsibly. Simple measures such as using noticeboards, staff portals and social media will help promote that.